Scroll down the page to find older news items and community links. If you're involved in gardening in the Toowoomba area and have news to share, please get in touch. The following advertisers may include online suppliers. For the most up-to-date information on plants in stock, opening hours, prices etc, be sure to visit the seller's website or contact the business directly. "The Gurus in the Garden"
Want to add style and value to your property? A one stop solution to your garden and landscape needs. Let us start by offering our design service. Local knowledge, passion and flare from local garden lovers. Next visit our Garden Centre. You'll be impressed and inspired by our range and quality. Pots, plants, giftware, pebbles, mulches, pond equipment and water features are all on display. Our landscape teams can quote on the whole job or just the bits you want to leave to the experts. For more information visit our WEBSITE. Martin Garden Centre is accredited under the Australian Garden Centre Accreditation Scheme. Toowoomba's most extensive selection of Plants. Decorative Pots, Flowers, Gift Baskets, Gift Vouchers, Garden Furniture and Garden needs. Garden Design Service - we visit your property, discuss your needs & design your garden to suit you. Plant and Product Sourcing Service - if we don't have the item you'd like in stock, we try our best to find what you want. True Blue Garden Centre is owned and operated by Les and Meredith Richters - self employed in Toowoomba nurseries since 1983. True Blue Garden Centre - State Winner for 2002 / 2003 Australian Garden Industry Awards and accredited under the Australian Garden Centre Accreditation Scheme. If you operate a retail nursery, garden centre, landscape supply yard, turf farm or other garden-related business located on the Gold Coast (or servicing that area), go to Information for advertisers, to learn more about promoting your business on this website, including current prices. In the city of Toowoomba stands the Mothers' Memorial, a tribute the sons who went to the First World War but did not return. To help fund construction of the monument, flowers of a beautiful fragrant violet widely grown in the region were gathered and sold, at threepence per bunch. In 1932, Toowoomba declared the violet its official floral emblem, and now forms part of the city's coat-of-arms. Toowoomba is the main service center for the Darling Downs, one of the nation's prime agricultural regions. Also known as "The Garden city", since 1949 it has staged the famous Toowoomba Carnival of Flowers. With such a proud horticultural history, it was sad that the violet which had been such an important part of that history, and which is a symbol of the city to this day, had been apparently lost. Nobody knew for sure which (if any) of the assorted strains offered for sale as "Toowoomba Violet" over the years were the original variety. If it had survived somewhere, how could it be distinguished from the many other cultivars, not to mention sports and hybrids, now growing in the region? Where was the true Toowoomba Violet? 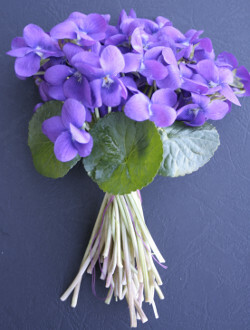 In 2009, horticultural teachers at Southern Queensland Institute of TAFE, decided to bring back the violet. First, they asked locals to contribute candidate plants from their home gardens, which were then cultivated at the college. At flowering time, prominent Toowoomba gardener and flower arranger Joan Falvey was asked to identify the flower closest to the Toowoomba Violet she once knew. As it turned out, the Toowoomba Violet had been growing in a TAFE teacher's garden for years! Subsequently, the variety has been identified as Viola odorata 'Princess of Wales'. Plants have been propagated at the college and sold locally through garden shows and campus plant sales, with some of the money benefiting the Toowoomba Hospice. However, numbers are still limited. Options for making the violet more widely available are currently being explored. Thanks to the efforts of the TAFE teachers and students, Joan and other dedicated gardeners, the coat-of-arms won't be the only place to see Toowoomba Violets. The fragrant flower is certain to be gracing more gardens in Toowoomba and beyond in the years to come. If creating a native garden, using species that occur naturally in your area can be beneficial environmentally as well as provide an extra interest to the garden. One of the problems, however, is finding information on what grew locally originally. Toowoomba gardener and author Patricia Gardner has come to the aid of Darling Downs residents with her Toowoomba Plants book duo, the first volume of which (Trees and Shrubs) is available now. It contains detailed descriptions of 277 trees, shrubs and mistletoes. The book isn't just for native enthusiasts, however, because Patricia concentrates on species suitable for residential properties. The range of drought-tolerant suggestions will help homeowners in the Toowoomba region and beyond create attractive gardens with less water. There is a particular focus on "dry rainforest" species. Patricia says these are good for homeowners wanting a rainforest look at home, because they are not only drought tolerant, but they tend to be smaller-growing than species from high-rainfall areas. Your council is a good place to start looking for information about public parks and gardens, watering restrictions, free tree programmes, environment and other local news and information. If you have a link you think is appropriate for this page, click here. Some older news which may still be of interest to residents of the region is retained below.